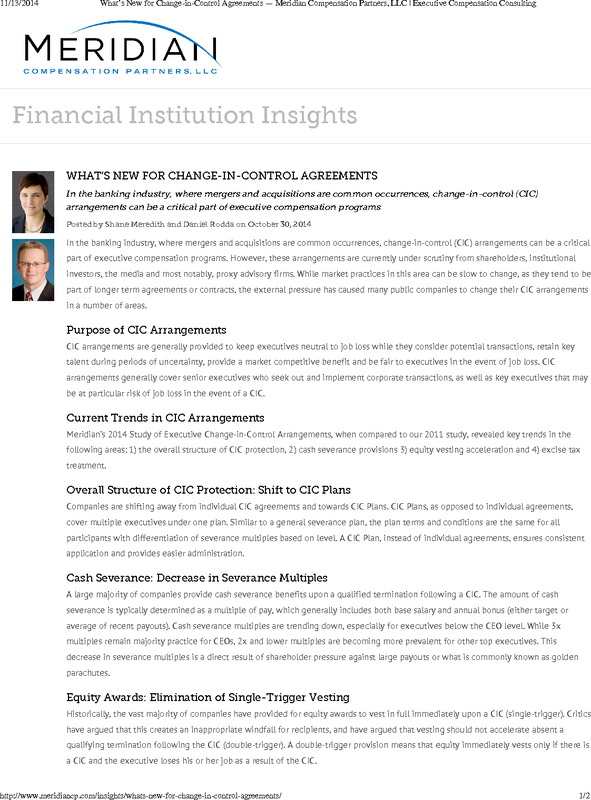 In the banking industry, where mergers and acquisitions are common occurrences, change-in-control (CIC) arrangements can be a critical part of executive compensation programs. However, these arrangements are currently under scrutiny from shareholders, institutional investors, the media and most notably, proxy advisory firms. While market practices in this area can be slow to change, as they tend to be part of longer term agreements or contracts, the external pressure has caused many public companies to change their CIC arrangements in a number of areas. CIC arrangements are generally provided to keep executives neutral to job loss while they consider potential transactions, retain key talent during periods of uncertainty, provide a market competitive benefit and be fair to executives in the event of job loss. CIC arrangements generally cover senior executives who seek out and implement corporate transactions, as well as key executives that may be at particular risk of job loss in the event of a CIC. Meridian’s 2014 Study of Executive Change-in-Control Arrangements, when compared to our 2011 study, revealed key trends in the following areas: 1) the overall structure of CIC protection, 2) cash severance provisions 3) equity vesting acceleration and 4) excise tax treatment. Companies are shifting away from individual CIC agreements and towards CIC Plans. CIC Plans, as opposed to individual agreements, cover multiple executives under one plan. Similar to a general severance plan, the plan terms and conditions are the same for all participants with differentiation of severance multiples based on level. A CIC Plan, instead of individual agreements, ensures consistent application and provides easier administration. A large majority of companies provide cash severance benefits upon a qualified termination following a CIC. The amount of cash severance is typically determined as a multiple of pay, which generally includes both base salary and annual bonus (either target or average of recent payouts). Cash severance multiples are trending down, especially for executives below the CEO level. While 3x multiples remain majority practice for CEOs, 2x and lower multiples are becoming more prevalent for other top executives. This decrease in severance multiples is a direct result of shareholder pressure against large payouts or what is commonly known as golden parachutes. Historically, the vast majority of companies have provided for equity awards to vest in full immediately upon a CIC (single-trigger). Critics have argued that this creates an inappropriate windfall for recipients, and have argued that vesting should not accelerate absent a qualifying termination following the CIC (double-trigger). A double-trigger provision means that equity immediately vests only if there is a CIC and the executive loses his or her job as a result of the CIC. Pressure from institutional shareholders and their advisors has led to significant change in the treatment of equity awards upon a CIC. While single-trigger provisions were majority practice in our 2011 study, it applied to only approximately one-third of equity awards in our 2014 study. The most common treatment in our study was double-trigger vesting. However, our study indicates that an emerging practice is to include a caveat on double-trigger vesting: equity will vest immediately if the equity is not assumed or replaced by the acquiring company. Federal tax regulations trigger a 20 percent excise tax when CIC benefits exceed a specified threshold. Because the tax can have disparate impact on executives depending on their past earnings, many companies have provided tax gross-ups to mitigate its impact. However, these provisions have faced tremendous scrutiny and criticism, which has led to a sharp decline in their use. 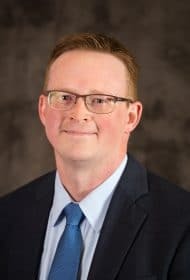 While many companies have been promising to exclude gross-ups from future agreements for several years, we are now seeing some companies remove them from current arrangements. This has accelerated the movement away from gross-up provisions, as they are now present at about only one-third of companies in our survey. Gross-ups have generally been replaced with a “best net benefit” provision, which is now the most common excise tax treatment. Under a best net benefit provision, an executive will receive the greater of 1) a capped benefit, with the amount reduced just below the threshold for triggering the excise tax, or 2) the full benefit, with the executive personally responsible for paying the excise tax. Change-in-control benefits continue to provide several important benefits to banks, but it is important to ensure that provisions balance shareholder and executive concerns. As market practices continue to evolve, it is important to periodically assess your CIC benefits and ensure they remain appropriate and effective.